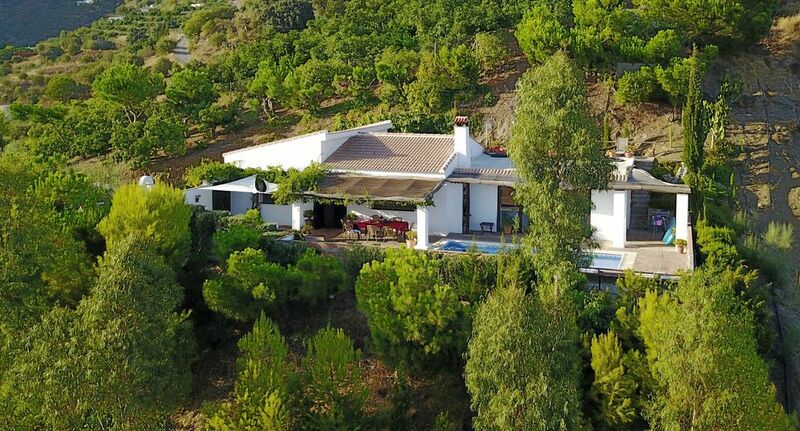 Set within beautiful countryside and located just two kilometres outside of the village of Torrox, Villa Mexicana offers total privacy without being isolated. The villa is built in rustic style and enjoys a commanding position high above the Torrox / Competa valleys with spectacular views of mountains and countryside down to the sea. Inside the villa has brightly decorated interiors comprising; a large bathroom, two double bedrooms, a bedroom with two single beds, a simple farmhouse kitchen with dining area, a spacious lounge with an open fireplace, satellite English/Spanish TV, book library and a collection of DVDs and games. The villa has very high ceilings ensuring that rooms remain cool in summer. In winter the wood burning stove keeps things cosy and warm. Outside there is private pool, ample terraces, enclosed patio a large secure parking area, orchards, etc.. This villa has road access to the villa entrance and so has good access summer and winter. Nearby Torrox Pueblo and around: Dating from Roman times the village of Torrox has steep winding streets and friendly people whose daily life remains focused on the rustic and traditional. It is a village full of atmosphere with attractive squares, cafes, shops and small Tapas bars. Just ten minutes away at the coast is the modern beach resort of Torrox Costa and the old town of Nerja. Here one can find more restaurants, tourist amenities and sandy beaches offering safe clean bathing. It is this combination of old and new which makes Torrox such an interesting place to stay, offering at the same time a quiet villa holiday in the Spanish countryside with the added convenience of having some very lovely Mediterranean beaches close by. For those with sightseeing in mind there are Roman ruins all along the coast, some impressive caves at Nerja and of course the Alhambra Palace at Granada. Activities and day trips from Torrox: There are many possibilities for activities during your stay in Torrox including, 4x4 trips into the mountains, scuba diving, horse riding, water parks for the kids (and parents), kayaking in the marine park at Nerja, walking (paths from the villa or nature parks), hiking (including refreshing canyon/ river walking) , wine tasting to name a few. Night life is well catered for with a number of nightclubs, discos and bars open at Torrox Costa, Nerja and Torre del Mar on the coast. Day trips to visit Gibraltar, Cordoba, Seville, Ronda and even Morocco for the more adventurous are all possible from the villa. We brought la Mexicana in 1998 after searching for some time for a quiet location with views near to the coast. The villa when purchaced was an old avocado farm. The house is still set within avocado groves but has been transformed into a modern dwelling with all the comforts of home. We like this area for the variety of activities and interests it provides. We are near to the National Park boudary of Sierra Tejeda and Alhama nature reserve which is great for walks and peace and quiet but equally close are historic towns and many beaches. So there is always something to do!. The rural location with its views and proximity to the coast, together with the intimacy and freedom of a self contained a villa which is a great base for enjoying and discovering our area. toilet, combination tub/shower, bidet, Second bathroom with toilet and shower enclosure..
Wood Burner for winter rentals. Wine and Chocolate Biscuits on arrival. Seating for six in a separate dining room. Available for hire nearby both electric and conventional. Boat trips can be arranged with prior booking. Golf within 14 mins drive. Smoking allowed in the exterior of the property. An ideal choice if you are looking for a traditional "Finca Style" country property but still within 15 minutes of the very pleasant resort and coastal town of Torrox Costa and within 10 minutes of Torrox Pueblo. I found the property very private and secluded, immaculately presented internally in "traditional style" with a beautiful outside terrace and pool. I would not hesitate to recommend this property if peace and quiet in the mountains of the Axarquia Valley is what you are looking for. Will definitely be returning in the future. We have just returned from a wonderful 3 week stay at Villa Mexicana - a perfect holiday, perfect location and villa (should we be saying this as we may not be able to book it again next year!!) Ken and Esther welcoming and low key; leaving us just to enjoy their fabulous home and pool. Lazy days punctuated by some wonderful trips into the towns .... we have stayed in many villas in the area and this is the best - accurate description and distance from the coast - 16 minutes to Nerja - beautifully clean and comfortable and all you need for a fabulous stay. An oven would have been nice but then again we lost weight as I didn't make bread! The villa really is luxurious, the pool will be in our dreams and the view idyllic. Thank you for making our holiday so fantastic - we will be back! My party and I (4 of us) had really relaxing and enjoyable week at this villa. On arrival the villa was clean and tidy, just ready for us to start enjoying ourselves. The location is very peaceful with excellent views from the terrace looking across the hills to the sea. After a quick trip to the local supermarkets we made full use of the built in barbecue and outdoor eating space. Plenty of local seafood, sausages and wines kept us supplied most evenings. For an evening out I can highly recommend the seaside town of Nerja just a few minutes drive away. Our hosts popped in during the week to see that we were okay and to help us keep the pool spick and span. Overall we all felt well looked after and thoroughly relaxed after our stay here, we just wished we had booked two weeks instead of one! We spent a great time at Villa la Mexicana! It's a simple yet special place where we felt home at once. Our memories are still very vivid: the quietness, the beautiful views, the charming gardens (and the delicious figues...) the laughs of our children playing in the fresh pool. Everything was simply perfect. Thanks again for your friendliness Ken and Esther, we would be delighted to come back. The villa is located five minutes (2km) drive from Torrox, ten minutes (6km) drive from sandy beaches and around forty minutes(40km) drive from Malaga International airport. Our guests find this an ideal location, allowing one to relax in a completely secluded setting in the Andalusian countryside and still enjoy all the attractions that the nearby Mediterranean coast has to offer just short drive away. Nearby Torrox and other Andalusian 'White Villages' such as Frigiliana and Competa cling to the sides of the Sierras and still conserve many of their traditional ways. Torrox makes an ideal base from which to explore this region with it's mountains, parks and famous old towns and cities. such as Malaga,Almeria, Granada, Gibraltar, Seville etc which are all possible day trips from Villa Mexicana. Golf: Golf is available at Bavaria Golf in Torre Del Mar and Anoretta Golf at Rincon de la Victoria both within 20 min of the villa. Ski: Sol y Nieve Resort at Granada (Sierra Nevada) is open for alpine skiing from November to May. The resort is approx 1 hour 15 min drive from the villa. Changeover day is normally Saturday. Minimum rental is normally one week. Shorter booking may be negotiated. Extra days are simply charged at 1/7th of the weekly rate. Entry to villla after 16:00Hours ay of arrival, leaving before 10:00am day of departure.